Agendas show you expect a productive meeting and not a rambling chat. Time spent planning up front, will increase your chances of delivering results by helping to keep everyone focused. A well thought out and communicated agenda helps people better prepare their thoughts and gather any relevant information they’ll need before the meeting starts. So how do you build an effective agenda? Who called the meeting and why? What is the context for the meeting? How does this meeting fit into your broader purpose? Once you’ve thought this through properly you should be able to crystallise this in 20 words or less. “Team meeting to discuss the changed scope and plan available resources for project XYZ.” The sentence encourages focussed thinking from the very start. Insert the sentence into your agenda, and be ready to recap them when the meeting starts. WHEN and WHERE are we meeting? Sounds obvious, and I know many client’s we’ve worked with tend to overlook this under the defence “well the same as always, of course”. I’d argue that it only costs you seconds to include the meeting place to avoid sarcasm and irony. Meetings are only as effective as the people who join (or don’t join) the meeting. Your agenda needs clarity about who will lead, present, or facilitate each point. You’ll also want to be explicit about who needs to be involved or is affected by each point on the agenda. Responsibility assignment matrix system like ARCI can very easily be integrated into your agenda. Do you want to reorganise the order of items so that a group of people can leave early? Avoid the ‘join late option’ if possible as the first few minutes is where you’ll review the all-important why. Do you want to give them the option of stepping out for this section? … yet make sure they are back in time for the next item? If yes, then make sure they are next door and not back upstairs or in another building. Do you want to address it as a “development opportunity” directly in the meeting along the lines of “I understand the next point isn’t relevant for you, but I think might help you to build a broader understanding of the project if you stay and listen”? Describe the “meeting items” so that they are simple and unambiguous… without being meaningless headings. This is where so many agenda templates fail. Roger Schwarz’s advice to “List agenda topics as questions the team needs to answer” is a great tip I found while I was writing this blog post. How much time is planned for this point? Who should do what in advance of the meeting? HOW can we improve our meetings? How exactly will we do this? What actionable to dos can we take? Watch this TED Talk “How to save the world (or at least yourself) from bad meetings”, by David Grady. Over the past year we’ve been working on 3 leadership projects with plant managers across Europe and the US. These projects have involved coaching talented operational managers on the verge of promotion to a more strategic level. For many of these managers this is a surprisingly tough jump. They are now no longer the sole “go-to “decision maker for their teams. Now they need to get the buy-in of their superiors and peers as part of getting their job done. … they need to influence others. Indeed, quite often the manager is so used to exercising power that they don’t know the difference between power and influencing. Part of our role in the training is to help them see the tangible differences between “I want you to do X and you do it. How you feel about it is secondary.” (power) and “ I know you’ll do what needs to be done because you want to do it and believe it is the right thing to do.” (influencing). Imagine two bulls colliding and locking horns. When two push-style leaders try to share the same operational space, problems can come up. During training and coaching we’ve heard this expressed as “He doesn’t listen to me”, “She discounts my expertise” and “It’s his way or no way”. When we’ve dug deeper and asked them how they have tried to influence the others, we often find they are solely relying on a directive or persuasive style of influencing (push styles) – as opposed to a collaborative or visionary style (pull styles). As part of our influencing training we work with clients to help them understand and use different influencing styles. No style is better or worse than another – each has its strengths and weaknesses, and each has its place. However, as Dale Carnegie so visually described in How to win friends and influence people applying one style to every situation is like “fishing with strawberries” … in other words ineffective and ultimately pointless. As the managers move to a more strategic role and need to deliver results in cooperation with other senior managers they need to develop different influencing styles. They need to sometimes “ask” and not just “tell” – to “pull” and not just “push”, and to let go of getting things done through their “power” alone. So what to do? As Marshall Goldsmith coined “What got you here, won’t get you there”. Relying on power alone won’t deliver the commitment needed for individual and organizational success. Senior managers need to master influencing as they climb. Acknowledging that the style and methods you are used to using aren’t working is a first big step. This may feel uncomfortable and sometime this can take far longer than you might expect! Being willing to try something different is the second. A simple tip is to always present more than one good option. If you are trying to influence somebody who is also a directive “push” influencer, keep in mind that (like you) they really dislike being boxed in with only one alternative. One alternative feels like an order. If you hear yourself saying “We have to…” or “Our only real option is…” it means you are probably still relying on your power. Put yourself in their shoes and try to find out what is important to your counterpart and include it in your reasoning. Let the other person know that you are trying to use their frame of reference. If you don’t know their interests and what they value, it is important to find out. Let him know that his success matters to you too. This blog post offers questions to consider as you try to understand your counterpart. Know what you can control, can influence and need to accept [https://www.mindtools.com/pages/article/control-influence-accept.htm]. Expand your influencing zone by developing more influencing tools. And then consider what you are going to say and how you will say it. This blog post on Linking and building to successfully influence others is worth your time. If you would like to know more about how we have successfully provided influencing training in face-to-face and virtual delivery formats across Europe and beyond then don’t hesitate to contact us. Conflict is an inevitable part of any relationship and in a recent post I shared 3 questions to ask yourself when you find yourself in a conflict situation. I appreciate that life isn’t as linear as a blog post and “3 questions” can come across as overly simplistic. So, based on a personal example, in this post I’d like to share what the questions look like in the real world. I work as a conflict mediator for a major EU institution and recently I was asked to travel to an African country. I was asked to mediate between a governmental body on one side and a large group of individuals from a very poor community on the other side. I’d travelled all the way from Luxembourg and when I arrived I called a meeting with all the individuals from this local community. I wanted to find out what was going on, what was the conflict about and learn much more about the history behind this conflict, the peoples’ interests etc. In other words, I wanted to find out Q1. What was actually going on, right in this moment? I started to get irritated, angry, and I could feel it growing. So I consciously took a deep breath, tried to clear my head and ask myself two questions – Q1 What was going on? and Q2 How did I feel? I felt I had answered the first and the second question but knew something was missing. How did I really feel about it? Well, in this moment I did fear for my personal career AND I thought I felt angry because I felt the locals were disrespecting me and my efforts. I asked myself the question again and tried to look more closely into myself. Angry was how I was acting but when I thought things through more I realised the actual emotion for me, in this situation, was more like disappointment. I wanted to help and had expected more. BUT, did the above reflections and emotions really give me a picture of what that little ‘meeting conflict’ was about? No, It didn’t! I looked again at what was going on… A meeting had been called. People were late, but then again, it’s Africa! They were running on ‘African time’ and I was running on ‘European time’. So it wasn’t personal nor was it a sign or rejection towards the mediation. We were just from two different cultures, with different expectations when it comes to time and punctuality. As for the risk of my career. Well, that is a systemic risk. It is always there, but it has nothing to do with the punctuality conflict at hand. I had 2 people out of a 100 for a meeting. That was a conflict, because 2 out of a 100 wouldn’t be able to give me a viable and complete picture of the conflict, nor could they be seen as representative of the local community which was required for the mediation to be effective. This conflict was however not at all related to a systemic risk back at home. As for the potential behaviour of the local authorities, that also wasn’t related to the conflict going on at this very moment. This was the norm. Simply put our brain is split in three parts, the Neocortex (the reflective and analytical part and also the newest part), the Limbic System (the emotional part, experienced through our emotions) and the Brainstem (sometimes called the reptilian part which governs flight or flight instincts). By forcing myself to ask and re-ask the 2 questions (What is it actually going on, right in this moment?, and How do you feel in this moment?) I had effectively de-escalated myself. I had helped my struggling brain to work as a whole and not get stuck in the lower brain parts. I could calm myself down so I could engage effectively in the meeting … when it finally started. By the way people did actually turn up. After one and a half hours! That just left me with the last question … How was I going to turn the conflict? Target Training has been delivering a range of conflict-related training solutions for the last 15 years. This includes “Handling critical conflict situations” and “Managing conflicts in virtual teams” . We also offer individual and team coaching solutions. Preben is a professional mediator and conflict manager. He focuses on human interactions, such as management and leadership, intercultural relationships and interpersonal communication. Until recently he was a welcomed part of Target Training and today works for a major European institution. In his private life he enjoys karate, hiking and climbing. What is it actually going on, right in this moment? When you find yourself in a conflict situation it is important to ask yourself what is actually happening? What is the “phenomenon”? The search for the phenomenon is hugely important and it is not always easily found. What exactly is happening, right this moment? Is it related to me, to my actions? Is it related to the budget discussions we are having? Is it related to old vendetta or a power battle between the two? How do you feel in this moment? This question sounds simple enough but can be unexpectedly difficult to truthfully answer when we are in the conflict itself. Work to get past the surface emotions and go deeper. How do you REALLY feel about what is happening? Answering these 2 questions alone significantly increase your chances of being part of the solution. They will help you solve the conflict constructively (de-escalate the situation); by forcing you to use the reflective part of your brain (the prefrontal cortex). As much as my ego would love to say the reflective brain part is always dominant, IT AIN’T. For none of us. It is the newest part of the brain, and the least dominant one. There is normally a “highway” of connections between the three brain parts/layers, but the moment we are in conflict, this “highway” narrows down to a one-way lane, and that seriously impairs our conflict handling skills. Now to return to our situation, the meeting situation with the team leaders, you are now standing there, and you have reflected and calmed your primitive part of the brain. It is time to ask the 3rd question. Let’s say you realise it is actually about one team leader being frustrated by a lack of resources. He is disappointed with the situation (and not angry, though it might appear so). Bear in mind his perception is REAL to him. He feels the other department has got all the resources and all the recognition. He has constructed a story in his mind and is now caught in emotions that are not necessarily related to the situation. OK, so what do you want to do about it? This is the third question. The third option. One way of deciding what to do, would be to focus on ‘choices of conflict strategy’ (problem-solving, forcing, avoiding, accommodation). Another could be to ask what ‘negotiation strategy’ will you use? By solving the first two questions the choice for the third one will become the more rational one, whatever it is you want to do. Whatever you choose to do, bear in mind that if you wish to reach these two individuals, with any message at all, you need to help the parts of their brain start communicating again (reopen their highways). You need to speak in short sentences and help them see what is actually going on (Q1) and how do they really feel at the moment (Q2). However you approach solving the conflict you can now see more clearly and can decide actively, with the conflict quickly analysed and you in control of your mind. Perhaps you now see a need for the ongoing discussion. Perhaps it is linked to the company strategy and valuable with this conflict addressed. You might choose to give the man the recognition he longs for (‘I am aware that your department has been a lot under pressure’. ‘I am also aware that this has nothing to do with the other department’. ‘Let’s have a separate meeting and talk about it’). Done SINCERELY, you have solved the problem for the moment. You do need to go back, as promised, and address it, but at least now the managers can hear you, and engage in the meeting at hand. Many of our communication skills seminars involve practical listening activities, and occasionally we get requests solely for listening skills. But it’s arguably wrong to see listening as one of many “communication skills” – listening is so much more fundamental than that. Listening builds trust, strengthens relationships, and resolves conflicts. It’s fundamental in everything we do. In a HBR article “the discipline of listening”, Ram Charan shared what many of us already know: Not every manager is a great listener. Charan’s own “knowledge of corporate leaders’ 360-degree feedback indicates that one out of four leaders has a listening deficit, “the effects of which can paralyze cross-unit collaboration, sink careers, and if it’s the CEO with the deficit, derail the company.” Good managers need to know how to listen – and great managers know how to listen well. And because we know you’re busy we’ve taken the time to find 3 TEDx talks for you listen to. William Ury is the co-author of “Getting to Yes”, the bestselling negotiation book in the world. This is a great video exploring what genuine listening really is, why it’s so important and how to take our first steps to improving our listening. He explains why he feels that listening is “the golden key to opening doors to human relationships” and why the skill of listening needs to be actively practiced every day. Ury uses stories of conversations with presidents and business leaders to show the simple power of listening: how it helps us understand the other person, how it helps us connect and build rapport and trust, and how it makes it more likely that you’ll be listened to too. Grabbing our attention with the shocking story of an angry reader, journalist Ronnie Polaneczky expands on why we need to consciously and actively practice our “listening muscle”. By practicing deliberate listening and putting aside our own judgements we can discover things we don’t know that we don’t know. She moves beyond the obvious “techniques” (e.g. look them in the eye, nod your head and repeat back what you’ve heard) and challenges us to think about letting go of positions (e.g. “I want to be right”) and embracing learning – letting go of our need to judge. She closes with the personal impact listening has – it doesn’t just change the person being listened to – it changes the listener. You may find this talk far removed from a business environment, but active listening skills are essential for those managers wanting to build a coaching approach. Jason Chare, a professional counselor, shares his experiences with an audience of teachers. The second half (around the ninth minute) begins to look at specific strategies and attitudes – especially the importance of unconditional positive regard and listening with empathy. Check out this article on “Three ways leaders can listen with more empathy” too! Wikihow’s “How to develop listening skills” is clear and simple. This document has 10 simple questions to evaluate your own listening skills. 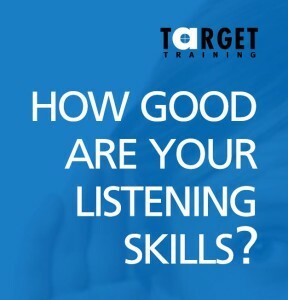 Active listening skills are covered in many of our training solutions, from Influencing skills, to our Practical toolbox for managers to Problem solving and decision making. This blog post is a clear and simple guide to what active listening really is and provides 7 tips for you. And if you’d like to know more about how you can further develop your or your team’s listening skills then please don’t hesitate to contact us. We’d love to listen to you. There are times in negotiations when we can be too focused on our own position. If we want to get the best outcome then we need to find out why the other side asks what it asks, offers what it offers, and wants what it wants. One of the most effective ways of doing this is by adopting an “investigative mindset” – and then actively listening to what is (or is not) said. Harvard Business School Professors Deepak Malhotra and Max Bazerman set out 5 key principles that underpin this method. This post provides a simple overview of the 5 principles, offers useful phrases for those looking to further improve their business English, and closes with some great suggestions for further reading. Asking questions to uncover needs and priorities is essential in any negotiation. The sooner you can find out what your counterparts wants AND WHY they want it, the sooner you can build solutions. Malhotra and Bazerman give the example of an US pharmaceutical company negotiating exclusive rights for an ingredient from a small European supplier. Despite the pharma company’s best offers, the supplier refused to agree to exclusivity. It was clear the smaller company had no chance of securing such a large order from any other customer – so what was going on? With the negotiation in deadlock the American negotiator decided to ask a simple question “Why wouldn’t they grant exclusivity?” The reason was equally simple – the supplier was selling a small amount of the ingredient to a family member who needed it to manufacture a product sold locally. A new offer was made and quickly accepted – the European firm would provide exclusivity except for a small annual amount for the supplier’s cousin. Whenever we go into a negotiation we always have limits. In fact having your BATNA clear up front is a must if you don’t want to leave the negotiation with regrets. These limits are influenced and/or restricted by external forces – pricing, strategy, risk, relationships etc. And just as you have limits, so does your counterpart. When your counterpart’s limits seem to be unreasonable or rigid, ask investigative questions to better understand what is behind the scenes. What is going on? Why is somebody responding like that? How can you help them remove their constraints or concerns? When our negotiating partner makes “excessive demands” we feel attacked and can become defensive. We then focus on either avoiding, mitigating, or even combatting this demand. The response of an investigative negotiator is to understand what is behind the demand and what they can actually learn from it. How can they reframe the demand from a threat to an opportunity? Malhotra and Bazerman article illustrates this nicely with the story of a construction company closing a major deal. Just before the deal was closed the property developer introduced a game-changing penalty clause for late completion. In this case, reframing looked like “why was this penalty clause so important?” which led to “ timely completion was hugely important” which then led to “was the developer interested in completion ahead of schedule?“ . The negotiation concluded with the construction company agreeing to pay higher penalties than proposed and with a sizable bonus for early completion. Despite the pervasive mantras of “partnership” and “win-win”, too often when we are in a negotiation it we end up with “”sides”. 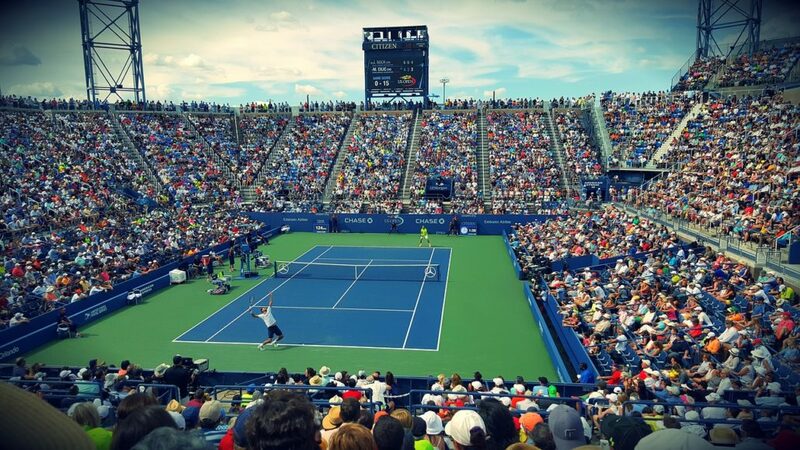 My side and your side, you are my competitor etc …This means that we miss out on opportunities to create value. Investigative negotiators focus on genuinely exploring areas of mutual interest to find real common ground. This can be especially important when negotiating across cultures. Even after rejection, there is nothing to be lost, and actually much to be gained, by asking “What would it have taken for us to reach agreement?” or “Can you explain to me why we lost this business? … as I’d like to learn for next time”. It is much easier to get unguarded information when there is no deal to be done. If you don’t know what went wrong, how can you improve your approach in similar future negotiations? And of course there is always a chance of actually reopening negotiations based on the new insight. Which part of my suggestion can you accept? Not accept? And why? Active listening (as the name suggests) is when you actively and fully concentrate on what is being said, rather than just passively hearing the words. Communication theory breaks what is being said into two elements – the content and the context. Content is the what – the data, the facts, the information etc. Context refers to everything else that is going on when somebody speaks with you – the relationship, the background, the situation, the emotions etc. Active listening involves paying close attention to the content being shared AND the contextual components between the listener (the receiver) and the speaker (the sender). Skilled active listeners can hear the what PLUS interest, emotion, concern, energy and other contextual factors from the speaker’s perspective. And they can hear what isn’t being said. Finally, as a training company, you just know we’re going to suggest organizing negotiation training for yourself or your team. Martin, an IT Project Manager, was getting ready for a meeting with his European counterparts to review his bank’s IT security. As ever he was very well prepared so I was a little surprised when he confessed to being nervous. However, it was not the meeting itself that was worrying him – it was the coffee and lunch breaks. His nerves were due to having to “small talk”. Small talk is an essential element of building relationships. Yes, the meeting is all about dealing with business and discussing the items on the agenda but it’s in the breaks in between where the relationships are forged. Why do some people find small talk so hard? When we run seminars on small talk and socializing in English we hear many reasons why people struggle when they have to make small talk. Some people don’t know what to say, some are afraid of saying the wrong thing, some don’t know how to start a conversation, some are scared that people will think they are boring, some people find small talk a waste of time…and the list goes on. All of these objections, and fears are magnified when we know we are going to have to do it in a foreign language. You prepare for the meeting so prepare for the small talk! The weather – The forecast says it’s going to rain for the next 2 days. What’s the weather like at this time of year in Cape Town? The event itself – I particularly enjoyed this morning’s presentation on big data analytics. What did you think of it? The venue – This is one of the best conference centres I’ve been to. What do you think of it? Jobs – How long have you been working in data security? Current affairs, but NOT politics – I see they’ve just started the latest trials on driverless cars. I’m not sure I’d want to travel in one. How do you feel about them? If you are going to ask questions, when possible, ask open questions. An open question begins with a question word – what, why, where, when, how etc. and the person will have to answer with more than a simple yes/no answer. Open question elicits more information and helps the conversation to develop. Similarly if you are asked a question (closed or open), give additional information and finish with a question. This will keep the conversation flowing. Hi, I don’t think we’ve met before. I’m Helena Weber from IT support in Ludwigsburg. I’m ready for a cup of coffee. Can I pour you one? I believe the restaurant here is excellent. Have you eaten here before? What did you do before you joined the product management team? Did you see the story on the news about…? It’s a while since I last saw you. What’s new? Life is about continuously learning. We sometimes learn from our mistakes, and we can also learn from our successes. This was first brought to my attention early on in my career. After the successful completion of a tough project, we had a meeting with our team leader where we were questioned on both what had we done well and how could the project have gone smoother. Today, in the international automotive company where I work as an InCorporate Trainer training business English, Lessons Learned meetings are an integral part of any project. What happens in a “lessons learned” meeting? Most of us don’t enjoy talking about our mistakes, and when discussing mistakes it is important to be both accurate and respectful. One way to do this is by asking questions using the collective “we” rather than assigning specific blame. After all, you are a team! If we hadn’t worked overtime, we wouldn’t have finished within the deadline. We should have received that information earlier. We wouldn’t have had so many problems if we had communicated better. We could have saved a lot of money if we had identified the problem earlier. Another way of discussing mistakes is to use hypotheticals. These sentences help to make things less personal and more abstract. With this style of question, a hypothetical cause and effect in the past is identified and applied to future situations; a “What if…” style of identifying areas for potential improvement. What if we made some adjustments in our future labor projections? What if we ensured more timely delivery for our next project? How could we fulfill such a promise? What if we were informed sooner? How would that have affected the delivery date? What if we could improve our internal communication structure? How are some ways we could do this? What would have been the outcome if we had identified the problem sooner? Was our success unique to this project, or is it something we could replicate for future projects? What surprises did our team handle well, and how could we build off of that to prepare for other unexpected outcomes in the future? 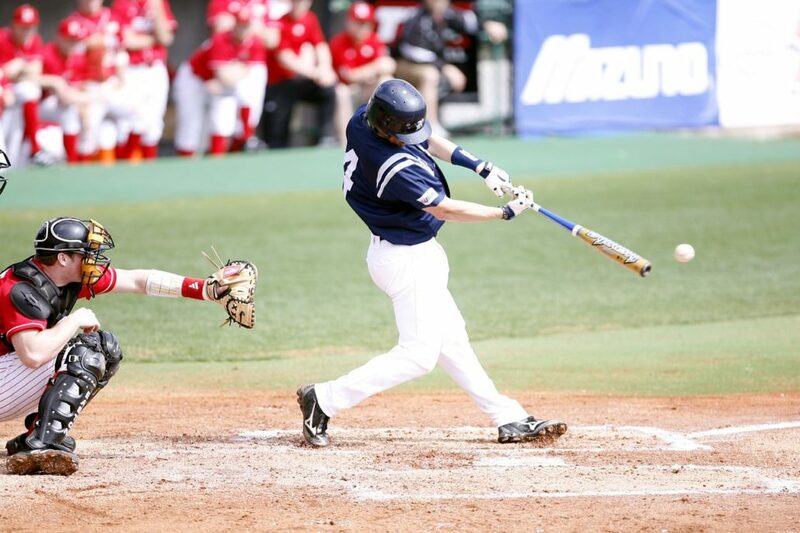 How could we re-formulate our achieved goals to really push the team to perform better? What value did our individual team members bring to the project? How can we increase our level of commitment and urgency? Implementing lessons learned meetings into your projects leads to team members growing in confidence, and an increase in performance and outcomes. Being aware of the impact language can have will help, as can facilitation skills , and building trust and a willingness to allow constructive conflicts in your team. Finally, there’s an excellent lessons learned template on Brad Egeland’s blog. Cornell University has a good overview of approaches and questions to use, and the University of Pennsylvania offers a lessons-learned checklists to help lead discussions. If you have any recommendations or would like to tell us about your experiences with lessons learned meetings, please feel free to do so below in the comments section. Recently I was working with a software development manager from a major German multinational. He’d just got off a 2 hour webex meeting and was frustrated. “I thought my English was pretty good – but what exactly does We’ve worked through it soup to nuts mean?!”. I could empathize. It was the first time I’d heard this expression myself and I needed to understand the context before I guessed it meant from beginning to end. Corporate and business buzzwords, jargon and expressions can be a challenge for native speakers – and when English isn’t your first language things get so much harder. What do we mean by corporate buzzwords and business lingo? Some expressions are used across all business sectors, are very well known, widely used and understood. “We’re moving to an open plan office in the hope that it will improve cross-pollination” (cross-pollination is the generation of ideas by combining people from different backgrounds and with different skill sets). Other expressions are specific to a certain business sector, for example marketing or auditing. This language (jargon) isn’t generally recognized outside the particular sector, e.g. Shoptimization is the way forward (using apps to optimize in-store shopping experience). Why do people talk like this? This is a good question. A part of good communication is about making things easy to understand buzzwords don’t always do this. Buzzwords are a type of jargon people use so they sound knowledgeable, up-to-date, important … or just cool or funny. Is it effective? Decide for yourself. The video in this post is an excellent demonstration. How many of the expressions do you recognize and understand? I am a native speaker of English and have almost 40 years experience in the corporate world and I understood less than half of what was said in the video above. So what can non-native English speakers do when confronted by too much corporate speak? Encourage colleagues and partners to avoid using too much business jargon. When you don’t understand stop and ask them to explain. Then once they have explained, ask them to use that kind of English rather than the special expressions. Consult a dictionary. Do this if some expressions are coming up regularly and you don’t understand them. Don’t spend time learning new jargon. Loop me in on that! = Keep me informed of what’s happening. He’s a disrupter. = He’s a person who changes the way things are done. I’m going to have to marinade on that. = I need time to think about it. Can you unpack that? = Can you give me more detail? That’s not even in our wheelhouse. = That’s not in our minds. That’s the silver bullet approach. = That’s the perfect solution. Can we talk about that offline? = Can we talk about that away from the main group? To summarize, don’t forget that even native English speakers struggle with business jargon and idiomatic expressions. If you follow the tips and make use of the links I’ve mentioned you will find it a little easier. “I am really enjoying my new role as Lean Audit Manager! The only issue is, meetings can sometimes be very challenging as I don’t always get the support and cooperation of everyone attending.” Claudia, a very experienced and highly qualified engineer who had recently been appointed as lean audit manager, said this to me a few weeks ago. Naturally, some team members can feel uncomfortable when their processes and working methods are scrutinized and analyzed. It is not unusual for this discomfort to surface in meetings as difficult and disruptive behaviour. The end result is that meetings can become unfocussed, unruly and unsatisfactory. The same is true for any meeting – sometimes some people behave badly. First of all remember this is your meeting, you have set the agenda and it is up to you make it work. Having said that, let’s look at some typical types of disruptive behaviour, what we can do to manage it and some useful English phrases. Some people love the sound of their own voice and will talk at length on any and every point and deny other people the opportunity to be heard. Some people seem oblivious to the actual agenda and seem intent on pursuing their own. If this behaviour is not quickly checked the meeting is in real danger of completely losing its focus. Keyis to step in early, stop them from talking and get back to the agenda. You will often find people who are intent on making comments, or having a conversation with their neighbour. Apart from being bad manners it is also very distracting. There are a number of techniques to handle this situation. For one, you can stop the meeting discussion, be quiet and look at the people talking. Very often they will feel uncomfortable and fall silent very quickly. If individuals are behaving badly resist the temptation to single them out. This can lead to a hardening of attitudes. Instead highlight the unacceptable behaviour and its negative impact. Think about your own style as well as the needs and preferences of those attending your meeting. This will help you to find the most appropriate and most effective way of handling difficult behaviors in your meetings. In last week’s post What to do before the meeting begins – 4 added-value ideas from great chair persons and facilitators we’ve worked with we shared 4 great techniques we’ve picked up from experienced chairpersons and facilitators during meeting facilitation seminars. This post keeps sharing the sharing. As trainers, we get to listen to and learn from our clients – and then you get to benefit from not only our knowledge and experience, but their’ s too! So here are 5 easy-to-implement ideas to make you an even better chair or facilitator AND make your meetings that much more effective. Taking the time after the meeting to talk about how the meeting went means you can continually improve not just your skills, but the effectiveness and efficiency of your meetings too. Debriefing is all about identifying behaviours to maintain and things to do differently during the following meetings – and top performing teams take the time to reflect. You could integrate it into your agenda or agree upon reflection intervals. My own experience is that immediacy is better. When asked to think about the last e.g. 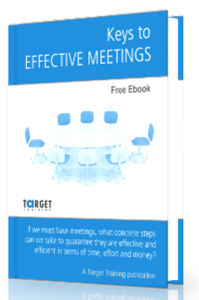 6 meetings, people too often tend to either focus on the last 1 or 2 events, or speak in broad and vague generalizations that are more difficult to act upon. Whether they be formal or informal, an executive summary or agenda-based, action-oriented minutes or verbatim, it’s a good idea to write them and send them out! Great chair persons understand and commit to always having minutes. They don’t approach them with a “we have proof” mentality – but rather with a “building” and “commitment” mentality. And they also give people an opportunity to review and add to the minutes. But they have them. People are wonderfully different – and this means that not everyone is going to contribute equally in your meetings. It could simply be shyness, or perhaps an issue of interpersonal dynamics or politics. More often than not it could be that an idea or opinion wasn’t fully formed and the person chose to think it through before speaking (especially if they have what the MBTI refers to as an “Introvert” preference). It’s too easy (and destructive) to take a “If you don’t say it in the meeting you lost your chance”. Plan time after the meeting is over so participants who need time to reflect can have a chance to share their insights. This also helps to build trust. … plus a hundred other things which are best done on a one-to-one basis. It’s not politicking – it’s about building authentic relationships. If people have had the chance to share their opinions and ideas and robustly discuss options in your meting then you can expect real commitment to the agreed action. And if people have committed then you can hold them accountable. Great chair persons explicitly review the commitments at the end of the meeting AND they follow up later on. When they follow up they have an “inquisitive” and “supportive” approach. They understand that things may have changed since the meeting, that priorities may have shifted and that resources may have been over-estimated or diverted. But they follow up. Plenty more meetings where that came from… And for even more information on how to make your meetings and your performance during meetings more successful, please contact us. We love to talk! One of the best things about being a trainer is that you get to meet a lot of people from diverse backgrounds. As trainers we get to listen to and learn from our clients – and we then get to share ideas, experiences and best practices with other clients. Below are some of the great ideas that top chairpersons and facilitators have identified over the last years during meeting facilitation seminars. Do you know who needs to be in the meeting and what they’ll be bringing to the table? Know who to address about which topic when. This is especially useful if you have meeting participants who are quieter or introspective. Know who to ask specific technical questions. Do you invest time before the meeting to talk with the participants? This idea is too often quickly mislabelled as “politics”, but all of the truly impressive chairpersons I’ve been lucky enough to work with have stood by the idea. Great chairpersons and facilitators make the time to talk with individuals who will participate in the meeting about the meeting before the meeting begins. They do this to uncover interests, hear concerns and objections, and win support. They are then better able to connect interests, help others save face and steer discussions down constructive avenues. Do you build your own ground rules – and review them at the start of every meeting? Many organizations have established “meeting ground rules”. These may be unspoken, hidden away on the Intranet or printed on colourful posters and put in the meeting rooms. The advice is often solid and sensible. Top chair persons and facilitators also tend to review them very quickly at the start of every meeting. One extroverted investment fund manager I worked with sang them and, to keep things fresh, changed the tune at least every quarter. You won’t be surprised to hear that his peers had mixed reactions to this idea (“It is not a serious idea Fabio, we are a bank!”) – but apparently his team loved it, and meeting attendance was high. Are you building trust through building relationships and enabling “rough discussions”? But more importantly, as one German manager said “Rough discussions are important so we don’t keep having the same discussions again and again”. This ties in with Patrick Lencioni’s 5 dysfunctions of a team idea that great chairpersons believe the more they know about the participants, the better they can facilitate open discussions. They’ll know when to push and when to stop, when to mine conflict in the meeting (force buried disagreements to light in order to work through them) and when to deal with issues in smaller groups. Building trust is a long-term investment, but as many meetings are chaired by the teams manager anyway it is an investment that pays off. Most of us have been there at least once in our professional lives: You enter or leave the meeting wondering why you were invited and how you will make up for the precious time you’ve just lost by attending the meeting. And you wish the meeting organizer had stopped to ask “Do we really need this meeting?” before the meeting took place. Is a meeting the right format? For example, if the goal of your meeting is only to relay news to your team, maybe you can save everyone time and send an email instead? Can, for example, everyone on your team make it to the meeting? If you’re relaying important news, will they feel left out? Thinking about alternative formats to meetings can reduce the total amount of meetings you need to have with your team. There are pros and cons of meetings, emails, community updates etc., and there is no right or wrong. You need to make the decision as to which is the right format for each situation. Is there a clear, definable aim for this meeting? A meeting without a specific aim is usually a waste of time. However, there are situations where the aim is vague. Perhaps, for example, you haven’t seen each other for a while. You may not have something specific to say, but explaining the situation helps everyone to understand why they are in the room. And meeting to catch up and network is a perfectly valid aim. There are also cultural considerations here – in some cultures meetings are to get work done, in other cultures they are to build relationships. There is no right or wrong, but a happy medium needs to be established in international environments. Are there negative consequences if we cancel? If you can’t think of any negative consequences of cancelling, then there’s no reason to have your meeting. If you do cancel with people you’ve already invited though, make sure you offer some explanation. And be honest. Don’t try to make up an excuse for cancelling it. Just explain what you are thinking. The chances are that most people will rate you very highly for doing this. Is now the right time to meet? Perhaps new developments in the near future will make your meeting unnecessary? Do you really need to have this meeting at the same time each week? Why are you calling the meeting in the middle of the holiday period? Giving a bit of thought about the situation now can save time later. If you answer ‘no’ to any of the questions above, then holding the meeting clearly does not make sense. Cancelling this meeting is definitely the best option. You save everyone valuable time – when you cancel a meeting, you and your colleagues can use that time to focus on tasks that add value to your organization. You save money – when you calculate the resources needed to hold a meeting, the price can be extremely high. You lead your regular meetings more effectively – knowing when to meet is just as important as knowing how to run a meeting. If you do this right, the participants in your meeting will know that their valuable time is always being used in the most effective way possible. For more tips and language for managing meetings in English, why not look at our ebooks and related blog posts. A few weeks ago I was chatting to a purchaser who worked in the automotive industry. The conversation drifted to the topic of negotiating and we began to compare countries and styles. The purchaser, a Norwegian, said half in jest but seriously enough, “You English cannot handle silence”. As a full-blooded Brit I can only agree. Many cultures, especially Scandinavians, are more comfortable with silence than others. But why is this? The impact of culture on how we communicate is certainly a factor. When I lived in Sweden I had the impression Swedes and Finns took a long time to thaw out and small talk consisted of a “Jaaaah”. The English, on the other hand, feel uncomfortable with silence and will often fill the air with meaningless chatter. Why am I sharing this? If, like me, you’re from a culture where communication is direct, silence is a hard skill to master. But whether it’s a cultural norm, a question of personality, or even a trained skill, being comfortable with silence when negotiating is essential if you want to reach your goals. When used in a subtle and careful manner, silence can reshape negotiations and extract surprising amounts of information while leaving your counterpart feeling they are in charge of the conversation. A good negotiator, no matter what nationality, will probably be assertive but charming, have good questioning skills, and handle pressure well. Questioning skills are a must – and here silence plays a role. Silence can prompt your counterpart to share more than they planned to – verbally or non-verbally. Poor negotiators will often answer their own question: “What price were you thinking of? I was going to suggest something in the region of € 105 per unit.”. Poor negotiators do not ask enough value added questions – a value added question being one that makes the other party pause and consider, e.g. “How did you arrive at that figure?” “What are the consequences for your clients?” “How can we help you sell this concept inside your organisation?” Answering value added questions needs time. Use the silence to observe your partner. Let’s assume you have asked a good question and the other party is taking his/her time to answer. A few seconds is not a problem, but after ten it can become tense. Learn to look serene and confident, smile at the other party, look at your notes and scribble something. Stay connected to the other party with body language and eye contact. At some point the other party may buy time and say “I’ll get back to you.” Alternatively you can also suggest moving on to another point. But give silence a chance. And if the roles are reversed you have the right to be silent. Do not shoot from the hip with a half-baked, badly thought through answer. Learn to be comfortable with silence. “I’m thinking this through”, “I’d like to explore this idea, give me a minute” or “I’ll get back to you.” will buy you time. Silence has to be practised and refined in training or coaching. Training helps you become aware of your relationship to silence; then develop the skills to use it subtly and effectively through role plays, real plays and critical incidents. Training goves you the opportunity to repeat situations and develop awareness, confidence and mechanisms for handling silence. You can practice asking the right questions, leaving room for the other party to develop a sensible answer, practice NOT shooting from the hip, and practice behavioural strategies that make the silence comfortable for both you and your opposite number. And remember – when negotiating silence is not a threat; silence is golden. The purpose pyramid is one of the simplest and yet effective communication models for introducing a presentation, opening a meeting or organizing your thoughts that there is. It is so simple, in fact, that no one seems to take credit for it though you will find it in the work of many communications gurus. 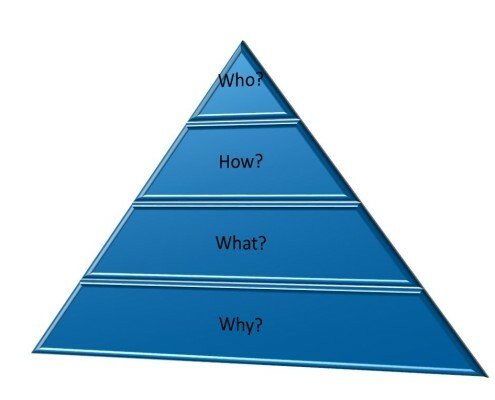 The four questions in the pyramid aren’t special by themselves, but together they offer a powerful way to connect what you want to do with the goals and needs of your organization, no matter what business you are in or function you perform. Why? + What? + How? + Who? = Alignment. The Purpose Pyramid makes it easy for you to structure your communication – in any situation. Why is where you share or remind your team about the deeper meaning and purpose of the organization. This is the reason that energizes you and your colleagues as well as your customers. What’s your why? Your purpose is best when it brings the energy of your team together and they can all see themselves in it. It should also attract internal and external customers to your work. A band plays music, by definition – but wouldn’t you rather see a band whose purpose is to give you high energy and a memorable musical experience? At a more nuts and bolts level, you can also apply the why to day-to-day interactions and situations. An example could be to state the purpose (why) of a meeting on the agenda for everyone to see. If there is a question about being on track, the team can refer to the mutually agreed purpose of the team. What refers to the tasks you and your team need to get done to contribute to making your purpose a reality. At their best these tasks are things you can track and observe easily so all can know when it is accomplished. For example, to have better meetings is not a clear task. Having everyone contribute to the meeting is a clear task. The SMART principle is a great model to use, just remember they should in some way contribute to achieving your purpose. An example could be to make task identification a two-step process. Instead of automatically identifying who should complete a task at the same time as identifying the task, outline just the tasks first. Going through the how before identifying who will help team members to know what they are committing to. How is where you turn to your method, approach or process, How will you get your tasks accomplished? For example, sticking with the “better meetings” example, if my task is to have everyone contribute to a meeting, I could tell the team members I expect them to contribute and hope for the best or I could use a polling technique in the meeting to give each attendee the space to speak uninterrupted. If a task is complex, the “how” could be a process or procedure that helps to complete the task effectively and efficiently. If you have standard operating procedures in place, this is the time to stress their use. An example could be to identify the resources and process necessary to complete a task before asking who will do it. Leaders get a chance to offer support to the team and may encourage team members to accept a stretch task because they know how they will be supported. Who refers to the individual and collective commitments or expectations that match your team to the tasks at hand. In most meetings the who stage tells how well we’ve done the other stages. If team members recognize and connect with their purpose, the necessity of a task and the process and resources to get it done, it’s a lot easier to agree to do them. With the clarity you’ve built earlier, it is easier for you to ask for what you want while committing to do what is necessary to support your team. A great question at the end of a meeting is “what have we agreed to do?” to check agreements without sounding like a task master. And/or let me know of any other useful communication tools that always work for you. I look forward to hearing from you! It’s 11:00 on Monday morning and your team, spread across the world, is about to dial in to a virtual meeting. Why? To update each other on what’s been going on over the past week, and what might happen over the next few weeks. In theory this could be really interesting, useful and beneficial, if it weren’t for the tight deadlines you have this week, and the knowledge that you’re going to be putting in a few late nights to meet them. Do you really need to spend time listening to Thierry, Namrata, and Quentin talking you through their week when you’ve got so much to do? They keep you all in contact with each other. Emails are useful, but you don’t talk to each other. There is no real chance to build rapport and trust with your colleagues on the team. They give the manager a chance to talk to and relay information to everyone at the same time. Things happen in the week and everyone then knows that they have an opportunity to talk about them on this regular occasion. Unless something has to be dealt with right now, you can save it until then and not interrupt everyone during the week. 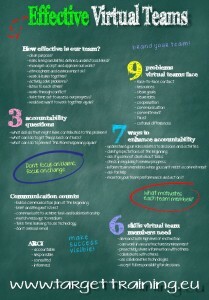 High performing teams help each other in difficult situations. If you don’t go to that meeting and share the fact that you are under pressure, nobody will be able to help you out. Everyone is, after all, working towards the same goals. What makes weekly update meetings great? If everyone is well-prepared and sticks to the agenda. If everyone takes turns to speak. If everyone shows interest when the others are speaking and reacts to what the speaker is saying. If the language used is clear so that everyone can understand. If the agenda varies from time to time. These meetings do run a risk of becoming routine. If you change the contact from time to time, this can help with the interest level. If everyone commits to agreed rules. If people refrain from doing other tasks at the same time as the meeting. Do you simply want to update and be updated or do you want to help improve your team’s performance? If you’re looking for alternatives to the weekly meeting, then these options might be useful. There is definitely a time and a place for emails, and they serve the purpose of conveying information. But they can be misread, and they can also be not read. There is no interaction and you have no chance to discuss responses with everyone at the same time unless you want an inbox bombardment. A lot of organizations now have their own internal social network. You can use communities for a wide range of purposes. You may also have a portal for your team. Why not use this to post updates before the meeting and then ask team members to talk specifically about one or two of the points? Alternatively they could ask questions on the portal/community that they would like help with. If everyone else has seen the issues in advance, then they have time to think, and will have something to contribute. What is the structure of the update? What do you want them to share? What tasks are they working on? How can the other members of the team help? What comes first, the coffee or the meeting? How we expect a meeting to run and how the meeting really progresses might be very different. We can all face the question, “When are we ready to get down to business?” So how do we find the correct balance between small talk and business? How should we identify what our partners (or participants) expect in advance? Find out about your audience in advance. What might be most important to them? Consider following the cues of others in the meeting. How and when do they ask questions? Think about potential differences in expectations and possible solutions in advance. Know what you want to achieve during the meeting and how you wish to do so. Be aware that the audience might not have the same goals or process in mind. Know both formal and informal phrases for dealing with different expectations. Know when to use the phrases you’ve identified. Be aware of the importance of company culture. What do the meeting participants expect? When should I begin discussing business? Is a formal or an informal tone better? Does my company have any official information I can refer to? Where can I go to find out more information about potential pitfalls? What do I feel is a good balance which will accommodate everyone? Would it be beneficial to receive extra training in this area? Specific People keep work and personal lives separate. As a result, they believe that relationships don’t have much of an impact on work objectives, and, although good relationships are important, they believe that people can work together without having a good relationship. Be direct and to the point. Focus on people’s objectives before you focus on strengthening relationships. Provide clear instructions, processes, and procedures. Allow people to keep their work and home lives separate. Diffuse People see an overlap between their work and personal life. They believe that good relationships are vital to meeting business objectives, and that their relationships with others will be the same, whether they are at work or meeting socially. People spend time outside work hours with colleagues and clients. Focus on building a good relationship before you focus on business objectives. Find out as much as you can about the people that you work with and the organizations that you do business with. Be prepared to discuss business on social occasions, and to have personal discussions at work. Try to avoid turning down invitations to social functions. Do functions and roles define relationships with others? Is written communication more important than face-to-face or telephone? Are closed questions more often used than open questions? Do relationships with others define functions and roles? Is the background story or information necessary for understanding specifics? Is it valuable to invest time in getting to know each other directly and personally? Although it might take a bit more time, considering the questions shown above should help you to be better prepared for meeting situations where individuals have different expectations. If you would like to learn more, have a look at our intercultural seminars or some more of our intercultural blog posts. 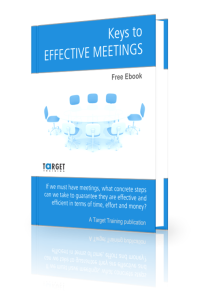 Download the eBook "Keys to Effective Meetings"
https://www.targettraining.eu/wp-content/uploads/2013/08/Interviewing-e1379761501730.jpg 360 923 Lynn Brincks https://www.targettraining.eu/wp-content/uploads/2013/04/logoWP.png Lynn Brincks2015-12-02 12:48:242018-06-06 12:29:28What comes first, the coffee or the meeting?